* For a list of validated stocks between 110 lb. Cover and 130 lb. Cover (301 gsm to 350 gsm), please consult the imagePRESS C850/C750/C650/C65 Series Specialty Media Handling Guide. Engine cassettes support up to 80 lb. Cover (220 gsm). ****Stocks longer than 19.2” in size support up to 110 lb. Cover (300 gsm). Whether you’re printing jobs for external clients or pushing through important print jobs for internal stakeholders, it’s crucial to keep your customers satisfied and that’s what the imagePRESS digital color presses are all about. 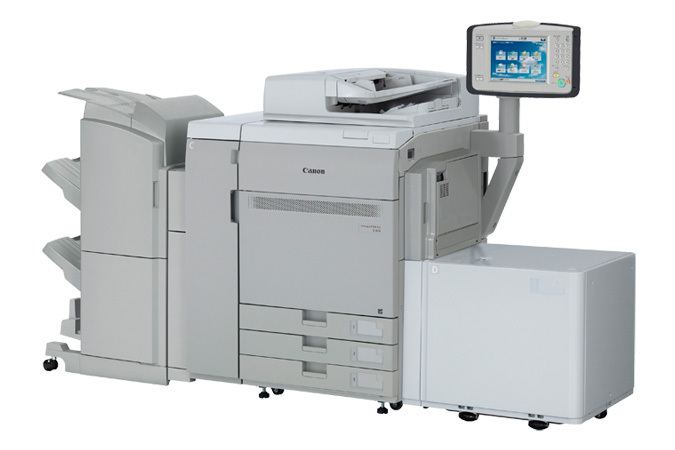 From enterprises responsible for office type printing and the printing of previously outsourced high quality marketing collateral to franchises where paper handling, space, and budget are key concerns, the imagePRESS C650 offers production grade features at a budget friendly investment. Designed for demanding production environments, the imagePRESS C650 can bring production grade reliability to high-end office and light production environments helping to ensure jobs are completed under tight deadlines. The built-in imagePRESS Printer Kit includes the capability to integrate with optional enterprise solutions such as uniFLOW and support for Canon’s MEAP platform, which helps simplify routine scanning, copying, and multifunctional workflow processes. High image quality on many paper stocks including plain, heavy, coated, specialty, as well as high productivity on complex and mixed media jobs help keep more print and scan jobs in-house, while producing presentation handouts, memos, flyers, forms, brochures, mailings, envelopes, and business cards. Get secure digital document management, individual client billing and more with Canon’s special legal discount.